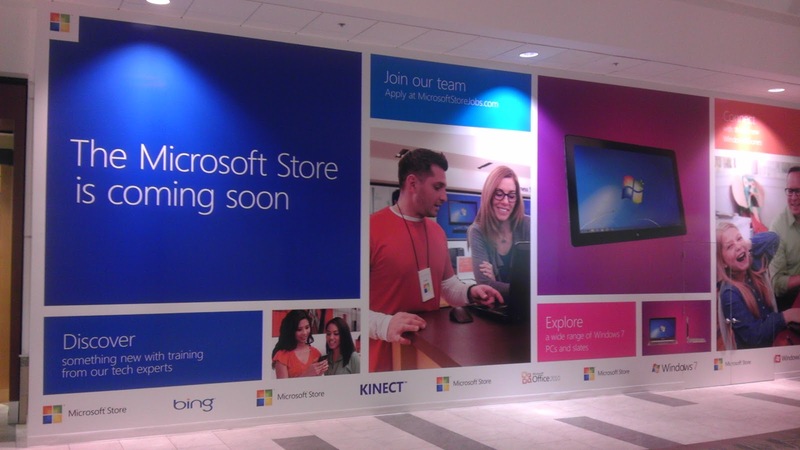 Oak Park Mall Microsoft Store Coming Soon! I had a chance to stop by the new Microsoft Store in Overland Park at the Oak Park Mall yesterday morning, and it was busy! I'm sure some of the interest was really for Blake Shelton, but plenty of people stuck around and shopped too. 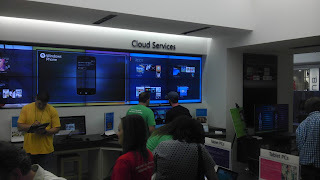 For those of you who haven't visited a Microsoft Store before its a lot like Apple stores. They have Microsoft products like software, hardware and whatnot. They also have lots of products from Microsoft OEM partners like Samsung and HP. 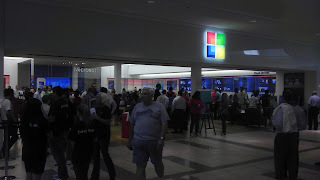 When I arrived I was met by a couple 'softies I know from the Overland Park Microsoft office. As a Microsoft Partner I was pointed to a separate table set up for just Partners. I was greeted again and handed a nice portable folding backpack-chair before I headed in to the store proper. At the entrance there was a long line of people waiting to take the Windows Phone Challenge. They give you a list of actions to perform on a Windows 7 Phone and if you can beat it with a non-Microsoft phone you had a chance at a $1,000 (or $100?) gift card. I bypassed the line (can't waste work hours playing games, right?) and went on in to the store. The store itself is brightly lit and inviting. There are rows of LCD monitors down both walls, looking almost like a single long monitor. There were rows of neatly arranged desks in the front of the store with a service counter / cashier in the middle toward the back. In the rear of the store was a "theater." I think that's stretching the term a bit, it's really just a medium-sized room behind the counter, separated by a glass panel. There were seats and tables and what might have been a presentation area. Apparently you can reserve it for events. It is also used for Summer Camps for kids ages 8-13. There are a series of events planned at the store already. 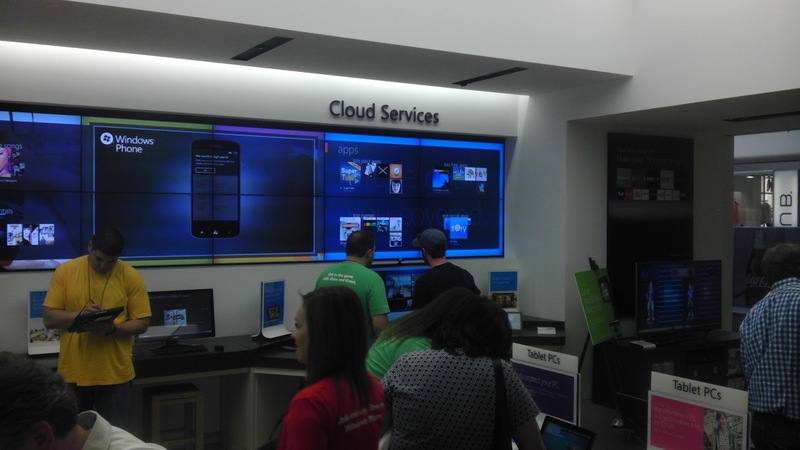 You can check the store website at http://content.microsoftstore.com/store/detail/Overland-Park-KS to sign up for events and camps and get information about the store and services they offer. Among the events are an Overland Park Chamber of Commerce breakfast reception today, a dance competition on the Xbox, and a few training classes on Microsoft Office applications (Word and Publisher so far). Continuing through the store, I found areas with different focuses. 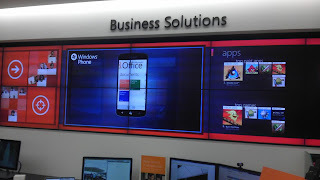 There was an area near the entrance with Windows 7 Phones. Moving back in to the store on the left side were business solutions and Microsoft hardware/software areas. There was a good selection of various different vendor solutions that ran Microsoft products as well as the Microsoft products themselves. You can purchase most of what is on display right within the store itself. It's also a hardware repair and software troubleshooting depot. They service many major manufacturer's equipment either in-store or through mail-in service. 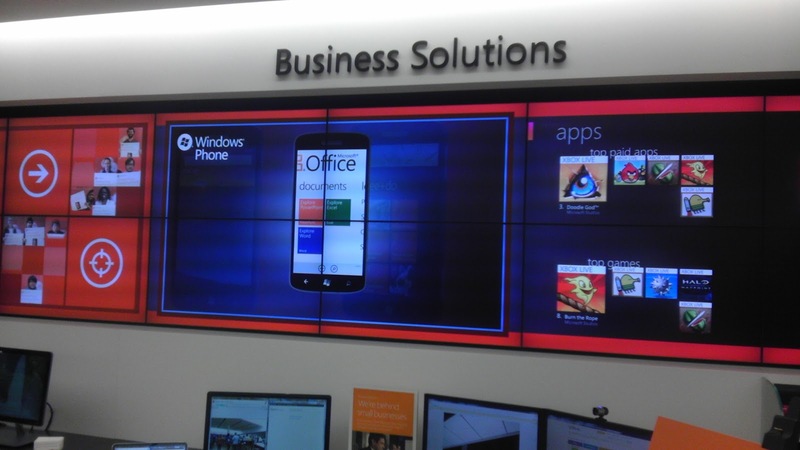 They offer hardware and software installation services for products purchased in-store as well. 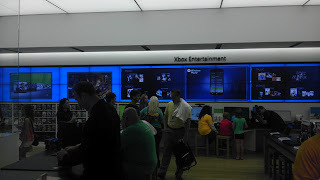 There was an area set up toward the back on the left side where they had an Xbox and Kinect set up. I saw kids busy back there for the whole time I was in the store. They're smart to put out stuff to keep kids busy while the parents shop. 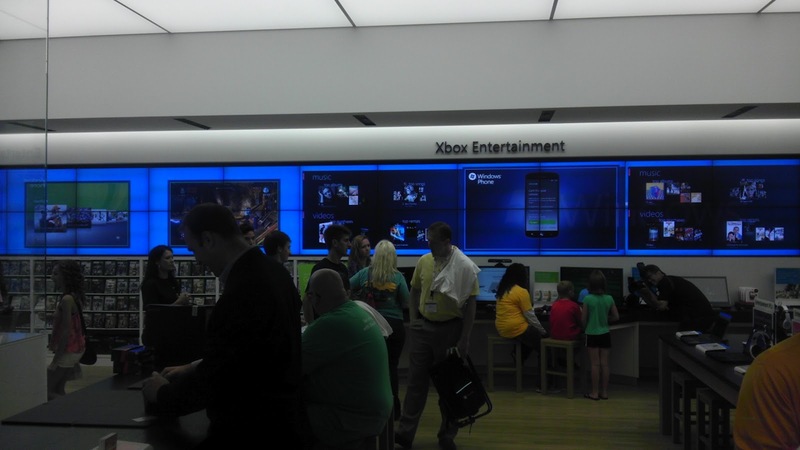 Although... to me, the whole store is a toy store... who needs the Xbox? There were PC games and hardware accessories back in that same area as well. Along the right side of the store I didn't see much in the "Cloud Services" area except more computers and some tablet PCs (no Surface yet!) on display. Hopefully that will change and they'll get some good Office 365, InTune and Azure messaging and demos going! Speaking of tablets, you can't see very well in the picture but they had several there including a Samsung that was loaded with a preview Windows 8 Pro version. I got a demo of the device and it was impressive. I'm interested in replacing my aging Acer Iconia a500 with something on which I can actually do some work. I think a Windows 8 Pro tablet might be the answer... I'll definitely have a look at the Microsoft Surface when it comes out. The kids that weren't playing or in line for the Xbox were all hanging out on the other side of the store... where the Xbox games were. They had a pretty good selection of Xbox games and accessories out although I didn't look too closely... I don't have an Xbox. Maybe I'll grab a 360 S when the Surface comes out and use SmartGlass on my new Surface. By then my aging Wii will probably need replacing... I'm sure my kids would approve! I'm excited to have a new place to hang out in the mall. Before, it was either Gamestop or Brookstone. Now I have twice as many gadgets to look at while my wife shops! Is it an Apple Store? No. It's not quite like anything else I've seen. Will it be successful? Considering that the store's purpose is really to build brand awareness and identity I think it's right where it should be. Enjoy the new store... I will! Linux, Linux! Wherefore Art Thou Linux?